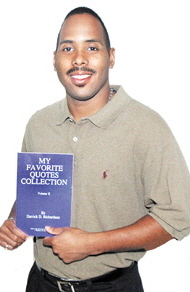 Derrick Richardson has been writing and collecting quotes for several years. His books show you just how the seemingly simple events in life may often turn out to be more difficult than expected. By including his own quotes as well as quotes from others, he encourages you to reflect on both your past and present experiences and then combine the two to help discover what you are really striving to achieve in life. Richardson includes just one quote on each page, leaving space for you to write your thoughts or comments below, creating a personal journal to treasure for years to come. Richardson was born in St. Louis Missouri and is a firefighter with the Alton Fire Department in Alton Illinois.